It’s a big day today with the Sun conjunct Mercury which is still retrograde, as you may have already guessed from everything going a bit crazy around you. So with that said and today looking as if retrograde Mercury will be hit with a dose of sunshine directly within its path you can look forward (or not) to things maybe going a bit more haywire than they have recently been. In rides the Knight of Cups to add a bit of flare and drama to what is otherwise a day of needing to keep your wits about you so you don’t lose any more of your precious time trying to sort out the messes Mercury retrograde has been making. Perhaps your partner will try to finally sit down with you today and talk things through. Well don’t go looking for any answers all at once because from the look of the image of the Knight of Cups he may have his emotions laid out for everyone to see but he doesn’t look as if he has any control or an inkling of what he really feels and/or wants underneath. For this reason you need to hear him out with an open mind (and heart) and not make any sudden decisions yourself until things have calmed down. If you lay one more thing at his feet he may either a) jump up to try to fix it quickly without thinking what he is saying or b) it will be the last straw for him and he’ll turn and run. The peacock feathers show he is displaying himself as something that he possibly is not yet he wants to impress you. The crab coming out of its shell which he holds so high over his head shouts… I am ready to let you see the real me. However, what you really need to look at is that he is dressed for speed and his sitting on a winged horse ready to make a quick getaway if he doesn’t like what he hears. If all of this is not enough to make you think twice and act cautiously then take a look at the peacock’s head which rests on his head as a helmet which resembles that of a joker and you decide if you wish to trust what is coming out of his mouth today or not. 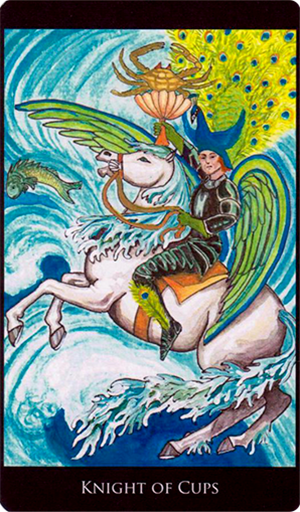 Today’s tarotscope — Knight of Cups — is part of the Rosetta Tarot series, by M.M. Meleen, used by generous permission. Copies of this deck — as well as its guidebook: The Book of Seshet — can be purchased directly from the artist herself, on the Rosetta Tarot site. Please be sure to check out M.M.’s blog. This deck is also now available for download for Apple or Android devices from the Fools Dog website.